Beverley Athletic Club has a short history dating back to February 1993. The club came about when newcomer to the area and keen runner, Peter Brown, suggested to the Leisure centre manager at the time, John Taylor, that in view of the number of people running around Beverley on their own there may be enough interest to form a running group at the leisure centre. Mr Taylor paid for an advertisement to appear in the Beverley Advertiser inviting interested parties to attend a meeting at the leisure centre. As a result of 15 people attending the meeting and expressing an interest it was decided to trial group runs on a Wednesday evening. Despite attendance figures of less than half a dozen in the early weeks, numbers slowly picked up and a decision was taken to become an affiliated athletics club. Since then annual membership figures have risen each year, topping 100 for the first time on 12th January 2000. Currently membership stands at approximately 180 and has also extended to a thriving and successful juniors club of approximately 30. Welcome to Beverley Athletic Club, established in 1993. We are a friendly running club interested primarily in road and cross country running. We welcome runners of all abilities, shapes, sizes and ages! We meet on Wednesdays at the Beverley Leisure centre at 6:30pm and we also have other sessions on Mondays, Tuesdays and Thursday available to compliment any training programme. If you are new to running, come and take those first steps with us, where you will be in safe hands. We also have a very enthusiastic junior club for members over 9 years old. The junior club meet on Wednesday evenings at 6pm at Beverley Leisure centre. Please see our Training Sessions section lower down/on the Calendar page for further detail of what we offer and where. Cycle Nights: Start 6:30pm 4th April, every Thursday. * Cycle nights are back! Time to dust off that bike that’s been stuck in the shed over winter. * Starting Thursday, 4th April, setting off from the leisure centre at 6:30pm and every Thursday thereafter, weather permitting. * Everyone is welcome, stipulations are – bike must be roadworthy; lights, hi-viz and helmets must be worn; and you must be familiar with the highway code. * First ride out will be flattish and around 20 ish miles; just to get the legs turning before we hit the hills later in the season. Great social activity and the bonus is that we finish at the Tiger Inn, Beverley for refreshments! Awards nominees and winners 2018. Here are the full list of nominees and winners fro Friday night’s ceremony. Well done to all our members, for making our club what it is. A big well done to all our very worthy winners. The Big Beverley Pancake Toss! The ‘Big Beverley Pancake Race’ is back again! All teams are welcome. Round up a team of four willing pancake tossers and join up, (preferably in fancy dress) to compete in the ‘Big Beverley Community Charity Pancake Race’ to be held in Butcher Row & Wednesday Market starting with registration at 11am, following with the first race at 11.30am on Sunday 3rd March 2019. Our resident Beaver, Bertie, will be in attendance! Entries need to be submitted by Thursday 27th Feb by 9 a.m. either in person at the town council or by email to Helen at clerk@beverley.gov.uk. Team entry £10 each. The annual awards ceremony which represents the previous calendar year of 2018 is to take place on Friday the 15th March at 7:30pm. This will be a great night in celebration of all our club members. Don’t miss out. Buy tickets here: Sports entry ticket purchase. Driffield Striders have organised a bus trip to London Marathon from Friday 26th to Sunday 28th at a cost per person of £249 (£95 single person supplement). 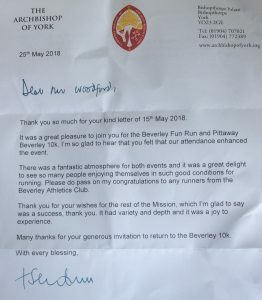 The have extended the invite to members of Beverley AC. Please see this attachment for further information. There are already cries for another event of the same ilk….and a winter version of it too! 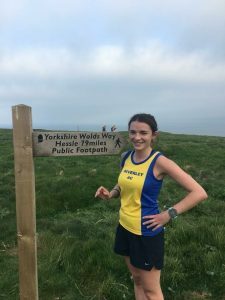 80 runners took on the challenging 79 mile, 8307 feet route, with the added “benefit” of a gorgeous sun beating down, navigating the mileage and elevation profile to be rewarded at the finish line by a crate of Wold Top Wolds Way beer. 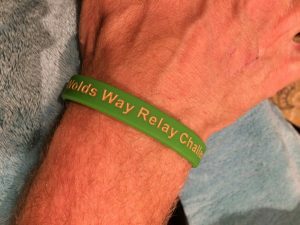 All the participants also earned a commemorative limited edition WWRC bracelet and the respect of their supporters and fellow team runners. Teams competed from East Hull Harriers, Beverley AC and friends, Driffield Striders, Barton and District AC and Caistor Running Club with all clubs finishing inside the projected finishing times. The event raised vital funds for National Trails so that beautiful routes like the Wolds Way remain accessible to all. 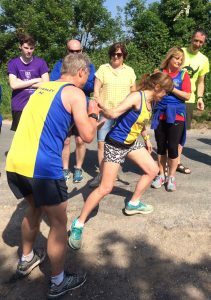 Many thanks to Andy Tate, Beverley AC club president, and Jayne Dale, club stalwart, for organising the event which was a huge success and an example of excellent camaraderie. 1st team – East Hull Harriers all male team came home first in a time of 10 hours and 14 minutes. 2nd team – Beverley and friends 10 hours 55. 5th team – Beverley All Stars 11 minutes 42. East Hull Harriers all male team take the first finishers spot and hold the John Baker Shield. Beverley and friends team finish in 2nd place. Beverley All Stars hand over Leg 2 (Andy) to Leg 3 (Jayne). Beverley All Starts final leg finisher, Nicole Dawson, in 11 hours and 42 minutes. Many thanks to organisers, runners and supporters, without you all there would have been no event. At Beverley AC this year we were lucky enough to be supported by Archbishop Dr John Sentamu, who included a visit to our B&A Scaffolding Fun Run and Pittaway Beverley 10k as part of his mission to Beverley. He was delighted to be such an active part in proceedings and was very impressed by everyone’s efforts. Well done Fun Runners and 10k’ers alike who made that day so special for him. Beverley Saints is a cycling group, originally established from runners of Beverley AC, but also includes friends and like minded people who enjoy the many health and social benefits by cycling on the many routes East Riding offers. The group does not indulge in competitive events and is not affiliated to British cycling, but is simply an informal group with its own identity and customised kit. We meet on Thursday evenings at 6.30pm from Beverley Leisure Complex (May – September) and generally cycle 20-25 miles with a pub stop at the end. The group are also looking to arrange some Sunday morning rides in the winter (weather permitting! ……Well actually closer to 18 minutes; obviously a slow sport news day. Listen here to your Press Officer, Bruce Woodford, and your Secretary, Fiona Oakes, representing the cub on Beverley FM on Sat 26th August 2017 talking about all things running and what we get up to in the club! Entries go live 12:00 on Saturday 2nd February. Click here to enter the Fun Run. Competitors should note that there will be no parking available at the Leisure Centre, as with last year. Alternative town centre car parks should be used, with the closest being Flemingate Shopping Centre, which is right opposite the entrance to the Leisure Centre. Please also note the new start times this year. 9 a.m. for the Fun Run and 10 a.m. for the 10k race. Lots of cracking photographs are now available on our site covering the start and the finish lines. View the gallery here. Beverley AC is proud to have local company ‘The Pittaway Group’ painters and decorators sponsor our amazing race. We’ve had a great write up from HU17.Net in May 2017, when our sponsorship relationship started. Thank you ‘Pittaway group’! We are proud to have our popular events sponsored by 2 local companies. Pittaway are sponsoring our sell-out 10k race and B&A Scaffolding sponsor the fun run. Pittaway painters and decorators and B&A scaffolding. We hope that these are partnerships that will last many years. Results: Pittaway Beverley 10k and B&A scaffolding fun run previous years. Specsavers Walkington 10k and the Pig & Whistle Fun run 12th July – Entries open! Missed out on Beverley? 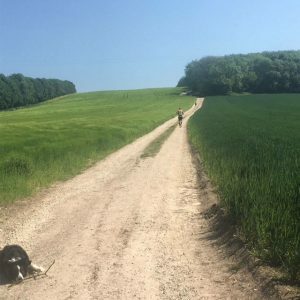 Fancy a beautiful, challenging route around our picturesque Yorkshire Wolds? The Specsavers Walkington 10k and the Pig & Whistle Fun run race will be on the evening of Friday the 12th July. Don’t forget the ultimate draw for this race………..The well stocked Cake Stall! Enter the 10k here. Why not get the kids involved and sign up to the fun run here. Hot off the press after member input, here is the list for 2019. Dalton Dash 10K – 17th March: Entries open here. Hornsea Third Marathon – 7th April Entries open here. EHH SL Leven 10k – Tuesday 28th May. Enter on the night. Withernsea 5 – 7th July Entries open here. Grimsby 10k – 21st July. Entries open. North Newbald 5 mile reverse handicap – 11th September. Club race. Bridlington Half – Oct 6th. Entries to open mid May. Here are the handicap results of the Gilberdyke 10. Here are the handicap results for 3 recent races. Burton Pidsea HC 2018Result Race 6. Withernsea 5 HC 2018 Results Race 8. Handicap results from the delayed Dalton Dash. Now updated to include missing bodies! Read more here about entering, volunteering and booking food. With a new year approaching, Lucas has put together a brief explanation of the Handicap and Knockout Cup Series for you all – an aide memories for long term members and useful info for the newbies. Each year the club has a Handicap Race Series; the Handicap League, along with the 10K series and Knockout Cup. The Handicap Series is made up of 12-15 races, nominated by the club. No one is obliged to run any, but the more you do the better chance of winning prizes at the end of the series. For each race you run you get points depending on how you perform versus your predicted time (handicap) based on recent results. At the end of the year the person with the most points from their best 6 races (2 short and 1 long plus best 3 others) wins. The 10K and under series is much the same but you only need to run 3 races of 10K or shorter to qualify and it’s your best 3 results. The Knockout Cup is drawn each year and then follows a grid format, with 64 members qualifying through various means. You are then encouraged to take part in the same race as your opponent within the time limit set out on the grid. The winner who progresses is the runner performing best against their handicap target. Within the list we include 2 club only races – Reverse Handicaps* – which are held at – Walkington (10K) and North Newbald (5 miles). We also have a winter race on a Sunday – the next one being South Dalton (5 miles) on 20th January 2019 which is a stand alone-event used for the final cup qualifiers. The full list of the Club Handicaps for 2019 is now on the club site, along with the first round draw for the 2019 Cup and updated rules. *Reverse Handicaps mean you start in reverse order of your predicted time so the slowest goes off first and the fastest last. In effect you should all finish at the same time if you run to your handicap. These usually mean the first across the line is the winner! 3 popular local LDWA events have started taking entries. It’s that time of year again to don the cycling shorts for the club Duathlon this year to be held on 28th June. This 2 mile run, 10 mile cycle and 2 mile run is a great opportunity for a bit of cross training. Food will be served at the Half Moon pub afterwards. Park at Half moon pub for 6:30 arrival, 6:35 briefing and 6:45 start. No parking at Skidby Mill restaurant. Book food (£3 payable) and notify Andy Tate that you would like to participate by Friday 22nd June, by emailing him here. Some fantastic results at this years Duathlon on a stunning evening in near perfect conditions. 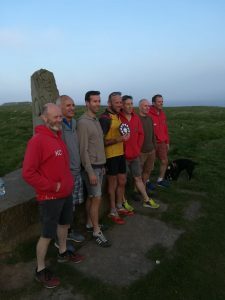 Top spots for the chaps belong to Peter Fielding-Smith, Graham Justice and Simon Pick, and in the ladies race Emma Greensmith, Fiona Oakes and Fiona Holland. With the Team event won by David Robinson and partner. Well done to all who took part and thank you to Andy Tate for organising and Mark Henderson for the timing service. View our AGM meeting minutes. The rules that run our club. How to join our club. You can see from our training schedule to the right that we give plenty of opportunity for our members to get and stay fit. 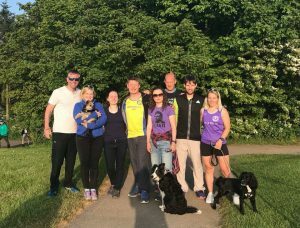 Our regular training sessions allow you to build up a great frienship with your fellow runners and gives you the opportunity to prepare yourself for the many races that our members can join in. Whatever your goals or motivation….come and train with us! The club runs 3 training sessions per week throughout the year all designed to complement any training programme, to help you achieve a goal, to improve your PBs or just to make you stronger, fitter and healthier. Monday nights are the club’s weekly speed work session, taken by a UKA qualified coach. The sessions are designed to be suitable for anyone capable of running with the club on a Wednesday night. These sessions include a mixture of faster paced running and mobility work, and are an excellent way to improve your running across the full range of race distances. All sessions meet at 6:30pm, with the meeting point for the winter sessions currently being Beverley Leisure Centre on Flemingate. During the Summer months meet on Newbald Road, near the junction with York Road. This is where the ice cream man often is. The session starts and finishes from here. Please contact secretarybeverleyac@gmail.com to confirm meeting location before attending. Wednesdays 6:30pm. A run where all the club set off together for any distance or speed to suit you. Distances vary from approximately 4 up to 10 miles. During the winter we try to arrange leaders for certain distances and speeds (generally 8 min miles, then every 30 seconds to 10 min miles). This is especially valuable for new-comers to the club. Meet at Beverley leisure centre HU17 0LT. Club run – Away night. Once a month from April to September (inclusive) a run is planned at an alternative location, convening afterwards in a local hostelry for food. As soon as the locations and dates have been confirmed, they are added to the club calendar. During the winter we often organise head torch runs, still setting off from the Leisure Centre, but taking advantage of the many footpaths and rural trails around Beverley. Trail shoes and a head torch essential! Thursday evenings are taken by a UKA qualified coach, and are designed to improve running technique and strength. The sessions are designed to be achievable by all, no matter what the starting point is as all of the activities can be scaled to the appropriate level. The session runs in term time only at the Longcroft lower school gym between 7 and 8 pm. The session will start at 7pm, so aim to arrive at 6:50pm. Parking is easiest from Church Road. Please remember all participants have a duty of care to themselves & motorists whilst crossing roads. Maps showing route divided down into a 10 leg relay available here. GPX files are also available, please click here. Leg 1 Wolds Way Relay Hessle Foreshore to near Riplingham 8.7 miles. Leg 2 Wolds Way Relay Near Riplingham to near North Newbald 8.8 miles. Leg 4 Wolds Way Relay Londesborough to near Huggate 8.9 miles. Leg 5 Wolds Way Relay Near Huggate to Thixendale 8.1 miles. Leg 7 Wolds Way Relay Near Settrington to near Sherburn 9.2 miles. Leg 8 Wolds Way Relay Near Sherburn to near Staxton 4.9 miles. Leg 9 Wolds Way Relay Near Staxton to near Flixton 3 miles. Leg 10 Wolds Way Relay Near Flixton to Filey Brigg finishing stone 7.2 miles. All the distances are available as GPX files from www.PlotaRoute.com and search for Beaver Trail. Or click this link. Have a wildcard entry from the draw made of club members who had not yet qualified in the aforementioned should there still be gaps after South Dalton. See full rules for details. Knock-out cup positions so far. This years knock-out cup has just seen the close of round 2……..Let’s see what’s happened so far. Knockout cup 2018 has kicked off…..! Update as of 3rd April 2018. And if you want to remind yourselves of the qualifying criteria and the rules please click here. Rankings: Up to September the 4th 2018. Please check that all your UK Athletics affiliated races are included on this spreadsheet. If a race is not local or runners are not associated with Beverley AC for one reason or another, results can be missed. Rankings as of close of year 2017. If you find any discrepancies or omissions, and when you have an achievement of your own please tell us by emailing me by clicking here. Thank you. Club secretary. If you want to add your name to the list please email Bev AC secretary. Here at Beverley AC we run a thriving and successful Juniors section. Juniors can only train and race from the age of 9 in accordance with U.K. Athletics affiliation rules. The juniors train once a week, on a Wednesday, and then either race or train every Sunday. We concentrate on cross-country and middle distance racing, not track. We travel across the Humber and all over Yorkshire for these races. It is expected that any member will commit to 80% of the training and race events in our calendar. Our Juniors news posts will appear in this part of the website. Beverley Athletic Club is just one of many clubs that enter races in this area of the country. You can see on a weblinks page a good representation of the numerous clubs that we compete against. Click on each image link to view their website. If yes, what name would you like? If yes, please name club and resignation date (if applicable). UKA/England Athletics Number (if known). Details shared with UK/England Athletics. Details shared with UK/England Athletics. I confirm I agree to my details being shared with UK/England Athletics. I hereby declare that I am an amateur I hereby declare that I am an amateur I hereby declare that I am an amateur according to the definition of the UKA. If you’re interested in contacting us to find out more about our club or you’ve seen enough from our website and want to join, then please see the contact details list below. You can email us directly or use the online form below. Please note our contact policy however, if you wish to contact us for any other reason than joining our club. It is Club policy that this website and the club email list remain advert and plea free. Contact the club by emailing secretarybeverleyac@gmail.com or use the contact form on the right.